About this Virtual Run: We live in the “Land of the Free, Because of the Brave.” Lest We Forget. Help us support a charity that serves the families of our armed service members by participating in the Lest We Forget virtual 5k/10k/Half Marathon. 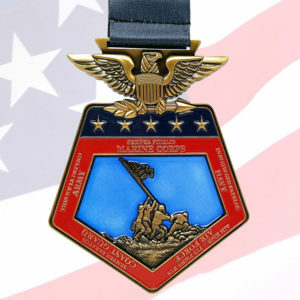 Run or walk whenever and wherever you want to support the cause and earn this patriotic 5″ medal, featuring a 3D-sculpted Iwo Jima flag raising in front of a stained glass blue sky background. Surrounding this iconic scene are the names of the five branches of the U.S. Armed Forces and each branch’s motto, all below a 3D American eagle. Photos do not do this medal justice – it is guaranteed to wow you in-person. A portion of the proceeds from this virtual race (at least $5 from each registration) will be donated to the National Military Family Association. For more information about this charity or to make a direct contribution, please visit MilitaryFamily.org.